MEDINA – The Village Planning Board this evening approved the site plan for the proposed conversion of 511 West Ave. into a hostel. The board’s OK followed last Thursday’s vote of support for the project by the Orleans County Planning Board. Andrew Meier, owner of the Hart House Hotel on West Center Street, wants to open the hostel with six rooms. The new business would be called Bunkhaus and would offer a clean and more affordable rest stop on the western end of the Erie Canal between Buffalo and Rochester. The first floor would have six rooms for the hostel. The two upper apartments would remain. WiFi would be available. The six former examination rooms would be outfitted with a bunk bed, lounge chair, clothing storage, sink and mirror, and area to store up to two bicycle. An existing bathroom would be shared by all of the patrons. • The board also was updated on the addition at Zambisto’s on Main Street, which will add room inside for dining and for parties and an option for rooftop dining. There is a target date of May 1 for completion. • Construction of the new Cobblestone Inn and Suites, a 58-room hotel, also is expected to get started in May on Maple Ridge Road. Photos by Ginny Kropf: Kathy Blackburn (right), president of the Orleans County Chamber of Commerce and vice president of Medina Business Association, assists owners and employees of Express Pool and Spa in the ribbon cutting Monday morning to celebrate the store’s opening. In front are owners Joshua and Sarah Ferguson (with ribbon and scissors). From left rear are Zach Cogar, service technician; Ethan Creig, seasonal technician; Laurie Seager (Sarah’s mother); Christianne Morreale, sales manager; and Mike Romano, service technician. MEDINA – It has always been Joshua Ferguson’s dream to own his own business by the time he was 30. Two years ago his wife Sarah got the ball rolling when she formed his LLC for his birthday. Joshua turned 30 on Feb. 11 this year, and plans were already well along for the opening of his and Sarah’s new business, Express Pool and Spa. On Monday morning the Fergusons cut the ribbon to celebrate the grand opening of their business, located at 3930 Salt Works Rd., near the corner of West Center Street. Express Pool and Spa offers a full line of pool supplies, covers, chemicals and parts, heaters, filters and pumps, as well as in-ground and above-ground pools. Joshua also operates JKF Services, for which he performs handyman services. “So we are able to install and repair decks, as well as install pools,” Sarah said. They also do liner inspections and repairs, and offer weekly pool servicing, as well as seasonal opening and closing of pools. 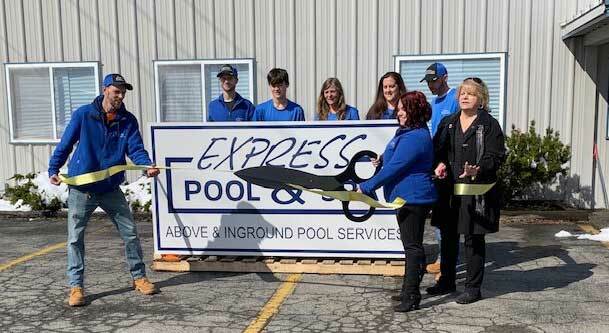 Express Pool and Spa employs Christianne Morreale of Lyndonville as sales manager, service technicians Mike Romano and Zach Cogar, and seasonal technician Ethan Creig. Express Pool and Spa is open from 10 a.m. to 6 p.m. Monday through Friday, 9 a.m. to 5 p.m. Saturday and 10 a.m. to 4 p.m. Sunday. For information call (585) 318-4769. 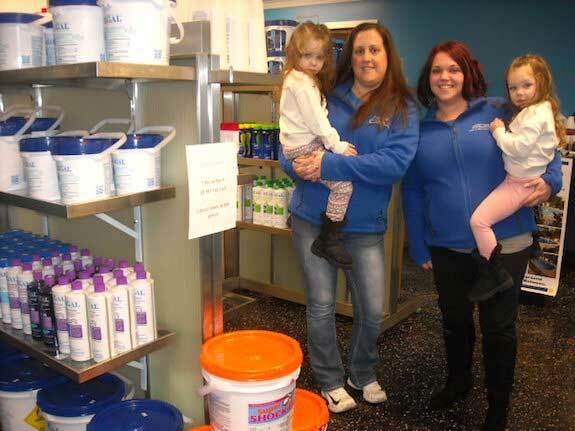 At left, Christianne Morreale, sales manager for Express Pool and Spa, and owner Sarah Ferguson hold Ferguson’s twins, 3-year-old Serenita and Joycelyn in the Ferguson’s new pool and spa store which officially opened Monday morning at 3930 Salt Works Rd. 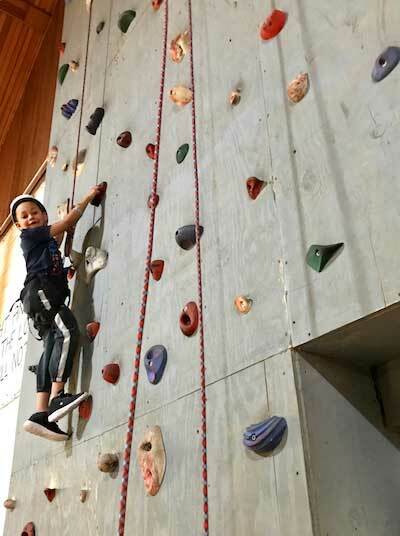 MEDINA – The Orleans County YMCA on Friday evening welcomed 125 children to the Y on Pearl Street in Medina for Healthy Kids Day. 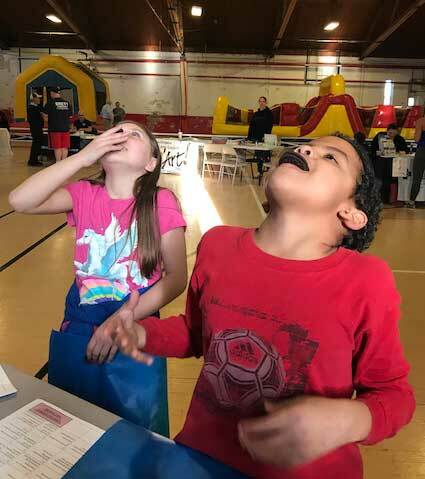 The annual Healthy Kids Day event at the Orleans County YMCA was popular among families and partnering agencies. The event grew this year in providing more activities and expanding the event outside of the gymnasium into the upper level of the facility where the Rock Wall was open, along with showcasing the new Fitness On Demand room and instructional boxing demonstrations with Theo Irwin, said Greg Reed, the Y executive director. 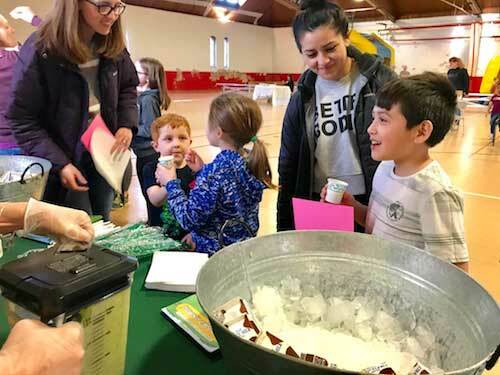 The gymnasium was packed with activities and explorative information for youth and parents to participate in as they filled in their HKD Bingo Card. Many of the activities were orchestrated and facilitated by these organizations: Orleans United DFC Coalition, Orleans Community Health, Fidelis Care, Genesee & Orleans County Health Departments, GO Art!, Lee-Whedon Memorial Library, Community Action of Orleans & Genesee/CCR&R, Cornell Cooperative Extension of Orleans County, NY State of Health, Hoag Library, Farm Credit East, Medina LOYALS Football Club, and Medina Lions Club. To top it all off, kids turned in their bingo card at the end of the night for a healthy snack to enjoy on the way home. 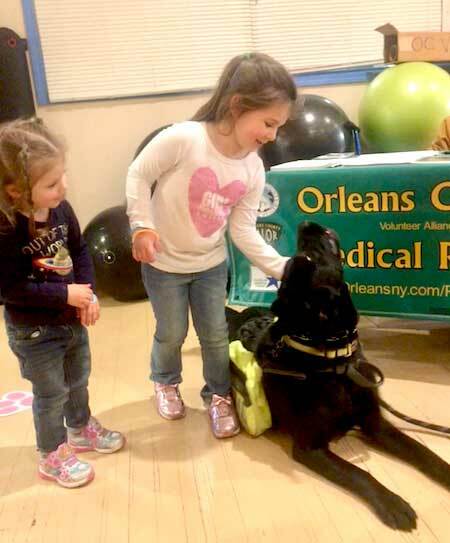 The Orleans County YMCA can’t wait to host this event again next year as it continues to grow, so be ready next March to bring your family to Healthy Kids Day 2020, Red said. 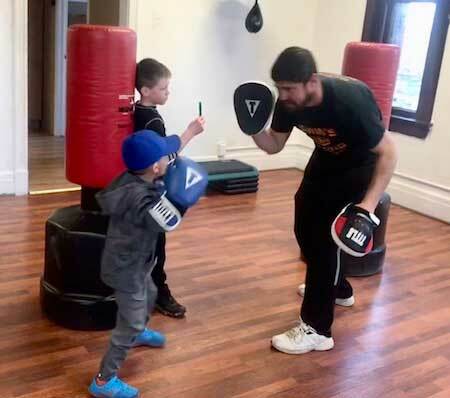 Theo Irwin provides some boxing tips to youngsters. Photos courtesy of Wendi Pencille: Medina’s varsity guard consists of 13 students in grades 7-12. This year their show is “I Can Only Imagine.” Many people experience the loss of a loved one and this show takes you on a journey that can bring back fond memories of that special person. The students performed with photographs of loved ones who have passed away. GATES – Medina’s Winterguard units competed at the North East Color Guard Circuit championships on Saturday, with Medina’s varsity coming in second just behind Corning-Painted Post. Medina earned a score of 82.91, with CPP at 83.48 during the championships at Gates-Chili High School. There were 33 guard units from western NY and Canada competing in 9 different classes. In addition, the ARC of Yates and the Heritage Hurricanes performed in exhibition and tied for Grand Champions. The Novice class consisted of 3 guard units and Medina earned 1st place followed by Legacy and the Hinsdale Starliners. The RA class had 7 guards in total and Medina earned 2nd place with a score of 82.91, bested by Lancaster with a score of 84.08. Winners in the other classes are Victor in the Cadet class with a score of 77.21; Batavia in the A1 class with 79.23; Magic of Scout House in the SR class with 78.24; Gates-Chili in the 1A class with 88.34; Victor in the SO class with 85.40; in the IO class the Lancaster Independent with 84.40. While Winterguard comes to a close for many of these students their skills and talents will now be channeled to spring street band, where practice began March 26. The band will travel to Boston, Mass. on April 25 for competition in parade as well as concert and jazz performances. They will also perform in the Seneca Fall Pageant May 17 and the Sherburne-Earlville Pageant on May 31. The band will perform for Medina during the Memorial Day parade on May 27. This photo shows all of the Medina’s Winterguard units. MEDINA – The Village of Medina is accepting applications for code enforcement officer to replace Marty Busch, who is retiring in July after 24 years in the position. The village will take applications until April 3, and has received two so far, Mayor Mike Sidari said. The village would like to have the new codes officer work with Busch for a little while before his retirement. For more on the position, click here. • The Village Board on Monday also accepted the low bid from K.D. Flooring of Medina to replace the carpeting in the Village Office on Park Avenue. KD Flooring will do the job for $5,222, using a square-tiled carpet. The space that will get new carpet includes the village clerk’s office, mayor’s office and the meeting room. Sidari said the village office will likely close on a Friday afternoon to give KD Flooring time to do the work before the office reopens on a Monday. • The Village Board also approved having classic car shows on Friday evenings in the Canal Basin, beginning June 7 and continuing until Aug. 23. The super cruise, when one end of Main Street is blocked off, is scheduled for Aug. 28. MEDINA – The Village Board approved a skate jam at Butts Park and a fund-raising sign that will look like a giant skateboard at Butts Park. The Medina Skate Society is working to raise money for a new skate park at Butts. The group is up to $22,000 so far. It needs to raise at least $50,000 in the next year to be receive a matching grant from the Tony Hawk & Ralph C. Wilson Jr. Foundation. Those organizations have committed to a minimum $50,000 if the community can raise that money by March 2020. The grant goes up to $250,000 in matching funds. The Medina Skate Society will have a skate jam on June 1 from 2 to 5 p.m. That event was approved by the Village Board earlier this week. The Skate Society also is planning a second skate jam on Sept. 14 from noon to 3 p.m. Both events will be free to attend and will include demonstrations by local skaters. Food, shirts and stickers will be available and the Skate Society will be accepting donations for the new Skate Park, said Alex Feig, Skate Society president. He also is working to have a thermometer sign at Butts to let the community know the fund-raising progress. Feig said that sign will resemble a large skateboard. The board gave him permission to put the sign on a fence at Butts Park. The Skate Society also is accepting donations on-line through a GoFundMe. 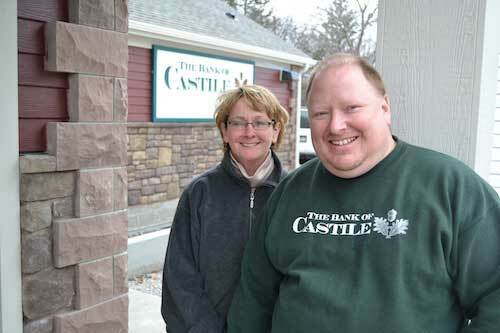 File photo: This photo on November 30, 2012 is from the opening day of the Bank of Castile’s branch in Medina at 1410 South Main Street. Patrick Weissend has been the branch manager since day 1. Amanda Pollard is the assistant branch manager. The Bank of Castile used some Medina sandstone in the building’s construction. BATAVIA – Tompkins Bank of Castile will be celebrating its 150th anniversary this spring. Together with our partners at Tompkins Insurance Agencies, and Tompkins Financial Advisors, we plan to acknowledge this important milestone in a number of ways and at several key events throughout the year. The anniversary celebrations will kick off at the original Tompkins Bank of Castile branch on May 1 and continue at the bank’s annual WNY informational shareholders meeting on May 14 at 5:30 p.m. at the Genesee Country Village and Museum. 150 years is certainly a long time, but it’s even more impressive when you consider that fewer than 5 percent of the banks currently operating today in the United States have been around as long as Tompkins Bank of Castile. What’s even more impressive is that Tompkins’ mission and values have remained the same, allowing us to consistently perform at a level ranking among the best in the industry. Tompkins Financial Corporation is committed to creating long-term value for its clients, communities, and shareholders. Based in Batavia, Tompkins Bank of Castile serves the GLOW (Genesee, Livingston, Orleans and Wyoming counties and beyond), Rochester, and recently expanded into Buffalo with the opening of the new Amherst location. “We believe in the power of the local people working together to help our communities grow and thrive,” McKenna continued. Since 1869, Tompkins has valued its employees and invested in the communities they serve by volunteering and donating to charities, nonprofits, and civic organizations. The Bank is a subsidiary of Tompkins Financial Corporation, which is also parent company to Tompkins Trust Company, Tompkins Mahopac Bank, Tompkins Insurance Agencies and Tompkins Financial Advisors. Together, Tompkins operates a total of 65 banking offices serving throughout New York and Pennsylvania. ALBION – The Orleans County Planning Board voted in favor of the site plan for turning a former dentist office into a hostel in Medina. Andrew Meier, owner of the Hart House Hotel on West Center Street, wants to open the hostel with six rooms at 511 West Ave. The new business would be called Bunkhaus and would offer a clean and more affordable rest stop on the western end of the Erie Canal between Buffalo and Rochester. The first floor would have six rooms for the hostel. The two upper apartments would remain. “I think this will be a real positive addition,” Meier told the Orleans County Planning Board on Thursday evening. Meier said the existing layout of the first floor wouldn’t be changed. He wants to make some cosmetic improvements from the current 1970s look of the space. Meier said the business would operate in tandem with the Hart House, sharing a phone line and cleaning crew. There is a large parking lot and secondary lots across from the Post Office, although many of the guests will be cyclists and won’t have a car. Meier said he expects many of the customers will be hikers or cyclists exploring the Erie Canal. Busch said the hostel offers another option for people to stay overnight in Medina. “It is more spartan accommodations than a typical hotel,” he said. 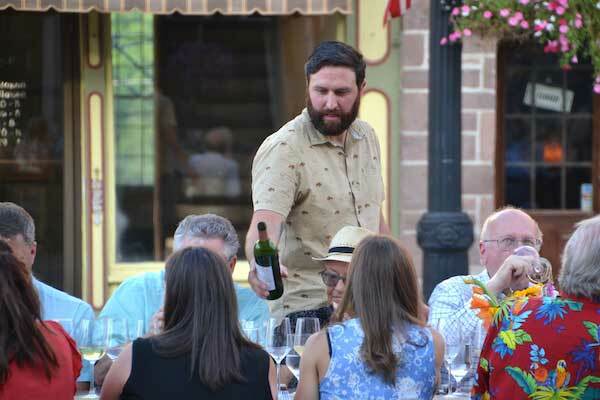 Photo by Tom Rivers: Jonathan Oakes, the winemaker at Leonard Oakes Estate Winery in Medina, serves wine during the third annual Farm-to-Table dinner last Aug. 2 in downtown Medina. MEDINA – Medina’s restaurant and cultural scene is getting a big spread in the Gusto section of The Buffalo News. It’s the kind of publicity that should bring more people to visit the community’s restaurants and businesses. An article posted online today by Francesca Bond has the headline, “Inside Medina’s Small-Town Culinary and Cultural Renaissance.” Click here to see the article. It highlights Mariachi De Oro, the Shirt Factory Café, Zambistro, 810 Meadworks, Fitzgibbon’s, Sourced Market and Eatery, and Mile 303. The article also highlights the efforts to renovate the former Bent’s Opera House, turning it into a restaurant, hotel and cultural center. Many of the restaurants and projects are led by young adults like Alix Gilman and her husband Scott Robinson, owners of the Shirt Factory Café, a coffee and cocktail bar. Gilman and Robinson are described as two people who grew up in Medina, went away for college and a career, and returned to open a business in their hometown. The article also notes Medina’s very popular farm-to-table dinner that sells out within an hour every year. The Orleans Renaissance Group organizes the dinner on a block-off section of Main Street. Last year 220 people attended the event. MEDINA – Legislation has been introduced in State Senate and Assembly to allow the Village of Medina to impose a 2 percent occupancy tax for room rentals in the village. State Sen. Robert Ortt, R-North Tonawanda, and State Assemblyman Michael Norris, R-Lockport, both introduced legislation on March 11. Norris’s proposal, Bill No. A06537, is cosponsored by Assemblyman Steve Hawley-R-Batavia. The legislation has been referred to the Assembly’s Ways and Means Committee. Ortt’s proposal, Bill No. S4451, is in the Senate Investigations and Government Operations Committee. The bills seek to give Medina permission to impose a hotel/motel occupancy tax of up to 2 percent. Medina village officials say the funds will towards promoting tourism and economic development in the community. The legislation says the tax shall apply to any “tourist home, inn, club, hotel, motel or other similar place of public accommodation.” The owners of the properties will be required to impose the tax. The village’s chief fiscal officer will then collect the tax. The tax does not apply to people who are considered “permanent residents” of a hotel or motel, those staying at least 30 consecutive days. Orleans County also imposes a 4 percent occupancy tax that generates about $35,000 a year and is used solely by the county for its tourism promotion efforts. Medina will see an increase in rooms with the renovation of the Bent’s Opera House to be partly used as a hotel. A new chain hotel, Cobblestone Inn & Suites, also is expected to break ground this year on Maple Ridge Road.